Say what???!!! Oils for acne-prone skin?! Yes. Hear me out. I’m not saying you should use just any oil. Some do make your acne flare up like crazy. But others… others help you regulate oil production, clear up your skin and keep your acne at bay. Really. Ok, let me start again. Linoleic acid is a fat. An essential fat (or essential fatty acid, to be precise). Essential means your body can’t produce it. And here lies the problem. Linoleic acid is naturally present in your skin. But when you have acne, your skin has way less linoleic acid than it needs. Cue acne. Dryness. Sensitivity. All sorts of bad things, basically. What Does Linoleic Acid Help Skin? It’s quite the multitasker, isn’t it? Without enough moisture, your skin gets all dry and flaky. It’s more prone to irritations. It heals way more slowly. And it’s pimples galore. You see how important it is to make sure your skin always has enough linoleic acid? Here’s the deal: it’s true your skin produces too much oil already. BUT it also lacks a specific kind of oil. You guessed it… Linoleic acid. Scientists think that linoleic acid plays a key role in the natural exfoliation process. Yep, your skin can exfoliate on its own. When it does, dead skin cells get off your skin. When it doesn’t, they get trapped in the pores, clog them up and become food for acne bacteria (the little buggers thrive on this stuff!). That’s why I keep telling everyone with acne to jump on the salicylic acid bandwagon, pronto! It helps your skin do the exfoliating job and keep those pores clean. Adding linoleic acid back into your skin helps with exfoliation and acne too. Studies show that using linoleic acid every day for a month reduces spot size and incidence by 25%. Sebum production is a hormonal matter. An enzyme 5α-reductase turns testotesrone into the (evil) superhero α-dihydrotestosterone. In plain English, this combo is bad news for your skin. It pumps up your oil production up a notch… or ten. Cue acne. Linoleic acid can inhibit the activity of 5α-reductase, keeping oil production under control. Related: What The Heck Is Sebum? I’ll be brief. Acne is an inflammatory disease. When it shows up, it means your immune system is busy fighting off a threat. Lots of things can cause inflammation. A diet rich in sugar and poor in vegs. Unprotected sun exposure. Pollution. Smoking. To name just a few culprits. Linoleic acid can soothe inflammation. Turn that down and your acne will start to disappear. Linoleic acid is an unsaturated fatty acid. Unsaturated fatty acids go bad pretty fast. So any oil with a high amount of linoleic acid will go bad faster than oils with a small amount of them. You’ll know when your oil goes bad. It’ll become rancid and start to smell awful. Sometimes, the colour can change, too. Packaging matters: only buy oils and creams packaged in an opaque bottle. Store them properly: in a cool, dark place away from light and heat. Preserve them right: adding antioxidants like vitamin E slows down deterioration. Use them quickly: don’t forget them in a drawer for months! What Are The Best Oils With Lanoleic Acid? NOTE: these are rough estimates. The exact amount of linoleic acid in each batch of oil varies depending on how the plant was grown (soil, climate etc). PRO TIP: when looking for creams/lotions with oils high in linoleic acid, make sure they’re at the top of the ingredient list. If you’re looking for a standalone oil, get the purest grade you can find. Make sure it has vitamin E to help it last longer, too! Related: What The Heck Is The Oil Cleansing Method And Why You Should Do It? Can You Use Linoleic Acid As Your Only Anti-Acne Weapon? You could… but I don’t recommend it. Pimples happen when the clogs in your pores get infected with bacteria (P. Acnes, to be precise). Linoleic acid can’t kill P.Acnes. Traditional anti-acne remedies like benzoyl peroxide or tea tree oil can. That’s why it’s best to use linoleic acid as part of your anti-acne toolkit. It tackles other causes of acne, the factors that make P.Acnes thrive so much. Starve the damn thing and it’ll slowly go away. Linoleic acid tackles acne in a different way: it promotes exfoliation, regulates oil production and reduces inflammation. 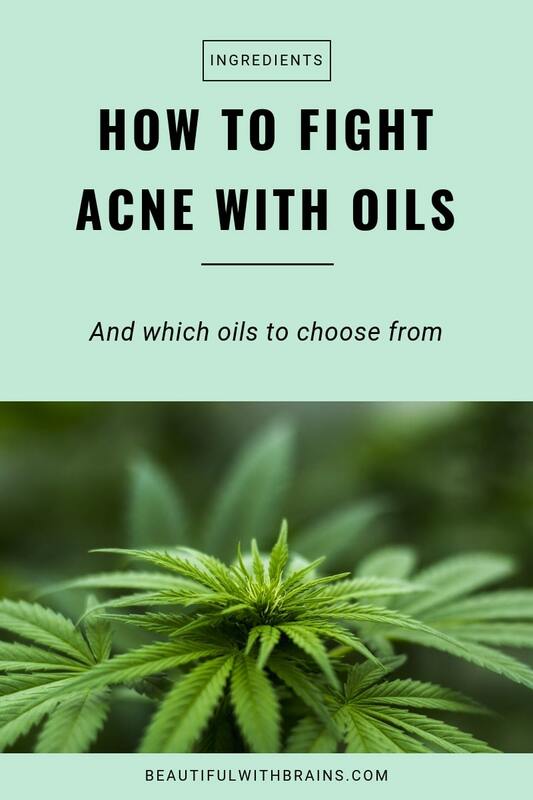 That makes any oil high in it a powerful ally in your fight against acne. Go on, give it a go. You’ll be amazed. Have you tried oils high in linoleic acid to treat your acne? Share your experience in the comments below. Does Retinaldehyde Works Better & Faster Than Retinol For Wrinkles? Is it smart to combine linoleic acid oils with other oils as part of the oil-cleansing method? For instance, say I combined it with castor oil and olive oil. Would that be a good idea? Or is it more effective to use it alone? Claire, I’d use them alone. Depending on the concentration of other oils, they may cause problems for your skin. and this: https://theskincareedit.com/2014/02/17/cause-of-skin-aging. I don’t know what to think anymore about vegetable face oils. Hope to hear from you but if not, it’s OK, I”m still reading your one of a kind beauty blog. Greetings from Romania! Gabi, first of all, let me tell you that all your comments went through. It’s just that when a person comments for the first time or adds more than a link to the comment, the comment ends up in my moderation queue. This is to avoid spam. I try to approve all good comments once a week but the past few weeks have been so hectic that I’ve fallen way behind with comments. That’s why they didn’t appear. I’m sorry for the inconvenience. Thanks for bringing this to my attention. I’m not sure what she bases her recommendation on as she doesn’t cite any scientific studies. My guess is that she’s basing her arguments on nutritional studies. When PUFA oils are consumed in large quantities, they can indeed cause inflammation, which triggers free radicals and leads to premature aging. There’s no proof this happens when you put these oils on your skin. On the contrary, there are plenty of studies that show that oils like rosehip prevents and treat premature aging. One more thing: completely removing PUFA oils from your diet is NOT a good idea as your body needs them too. In moderation. When you consume more omega-3 fatty acids than PUFA, your skin and body are happy. But in our Western diets, PUFA are everywhere so we eat way more of them than omega-3. It’s this unbalance between omega-3 and PUFA, not the PUFA oil itself, that leads to premature aging. Gio, can you just open up a capsule of evening primrose oil, for example, and spread it over your face or do you need to purchase a skin care product specifically designed for this purpose? Never heard about linoleic acid for acneic skin. Thank you for sharing this! GEO, I prefer to use specific skincare products because they’re properly formulated and offer more benefits. But you could use a capsule, if it states it can be used on skin. It really depends on how the oil was refined.